Asynchronously loading decreases the agent&apos;s ability to capture content and hook into libraries. You can improve the amount of captured data if the agent is still the first script to be executed on the page and defer all other scripts, especially Ajax libraries or scripts that use XMLHttpRequests. Basic XHR Detection is a generic wrapper for all requests performed with XMLHttpRequest. Selecting this module captures the Internet Explorer ActiveXObject. Because it has more overhead than specific framework wrappers, using the specific wrappers whenever possible is recommended. Some modules for specific frameworks require modifying the framework js file. This is necessary to trigger framework instrumentation directly after the framework is loaded. Manual XHR Framework Instrumentation contains a selection of the various code snippets to use. You can disable capturing. Stack traces are captured when enabled. Perceived render time This module calculates the perceived render time. This is the time it takes for all visible images to completely load, depending on the browser window size. When activated, perceived render time is calculated for each user action. See Perceived Render Time for more information. Streaming Captures information about HTML5 video and audio tags embedded into a webpage. Manual instrumentation is required for videos in Flash or Silverlight. User Timings Captures timings measured by the browser&apos;s performance.mark and performance.measure calls. Visually Complete Enables support for both the visually complete metric and the speed index metric. This setting is enabled by default in newly created system profiles. A page is visually complete when all the visual components have been rendered. It is the time when a user considers that the page is ready to interact with. It doesn&apos;t consider, for example, any Ajax request that could be going on behind the page. Visually complete can be captured for page load and for Ajax actions. See Visually Complete metric or the video on optimizing user experience for more information. The speed index is the average time at which visible parts of the page are displayed. It is useful for comparing the user experience of various pages. The lower the number, the better the user experience of the page. Speed index is only available for load actions. Visually complete is available for all load actions, but not for AJAX requests, which don&apos;t affect the DOM. Use the W3C Resource Timings section to enable detailed resource information capturing, and to capture all or a percentage of visits details to produce a resource waterfall chart for PurePaths using every page load action. Use waterfall and captured W3C resource timing data to help optimize the performance of your web application. Waterfall charting appears on the User Action PurePaths dashboard. See Web Performance Optimization for UEM and W3C Resource Timing Metrics for more information. First party: Any resource loaded from the application domain are assigned to the first party category. CDN: New system profiles have a list of preconfigured CDN domains. Resources from these domains are assigned to the CDN category. Third party: Any resources from other domains are categorized as third party. See the W3C Resource Timings section in Third-Party Content Analysis for more information. Domain Mapping See CDN Content Analysis for more information on mapping domains. 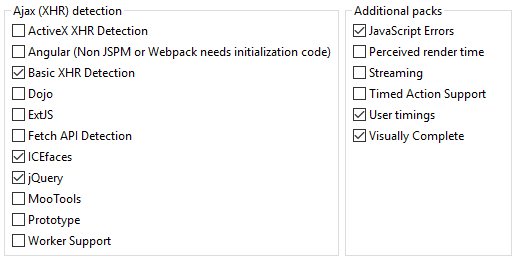 See the section Seeing full waterfall details in Web Performance Optimization for UEM for more information. Capturing resource information may cause overhead, especially on browsers that do not support the Resource Timing API. Calculate Bandwidth and refresh every Interval at which the bandwidth calculation repeats for a visit. The smaller the value the more accurate the bandwidth if it changes regularly. However, this also produces more overhead. For proper calculation, you also need to enable capture of web request/response sizes. See UEM FAQ for detailed info. Enable bandwidth calculation on mobile browsers Enables bandwidth calculation for mobile devices. Bandwidth calculation needs to download extra data. This overhead is often undesired on mobile devices. The option is only available if bandwidth calculation is enabled. Enabling bandwidth calculation on mobile browsers does not enable bandwidth calculation for mobile applications. Because of the impact on user data plans, the bandwidth is not calculated and does not display for mobile applications. Select the type of the metadata. Specify an ID for it. You can then use this ID for Measures and Business Transactions. Get the content attribute of the specified meta tag name. In addition to using a CSS selector to locate a particular element, you can also retrieve an element attribute value. To do so, add @ followed by the attribute name. The innerText or textContent of the element is retrieved if no attribute is specified. If the CSS selector query results in multiple elements, only the first element is captured. The variable must use dot notation for any Object property reference, for example someObject.property and not someObject[property]. Use brackets only when capturing Array values, such as &apos;someArray&apos;. Captured values appear as Metadata Details when you hover over a user action PurePath root node or select Details from its context menu. IP restrictions You can configure ranges of IP addresses to exclude or include from User Experience Management. For example, if you want to exclude all visits of your web site from the local network you can add the network mask of your local network to the list of excluded addresses. Browsers restrictions Include or exclude certain browsers and/or versions. Domain for AppMon cookies Overrides on which domain the AppMon cookies dtCookie, dtPC, and dtLatC should be set. Add the Secure attribute to the AppMon session cookie Useful for web sites that employ the HTTPS protocol for secure communications, this setting marks the AppMon session cookie dtCookie with the W3C-standard Secure attribute. This attribute instructs the web browser to only send the cookie over a secure connection. Send AppMon monitoring request to foreign domain The Same Origin Policy only allows XHRs that are sent to the same server delivering the web page itself, but UEMaaS requires a Web Server Agent to send the monitor signal to a different server. To resolve this, modern browsers (IE 8 and later, Chrome 4 and later, FireFox 3.5 and later, Safari 4 and later, Opera 12 and later) support CORS, which lets the web server decide whether it allows content to be delivered to a 3rd party site. Enable this here. Include the Anchor as part of the URI when determining an action name Select this check box to include the Anchor as part of the URI when determining an action name.